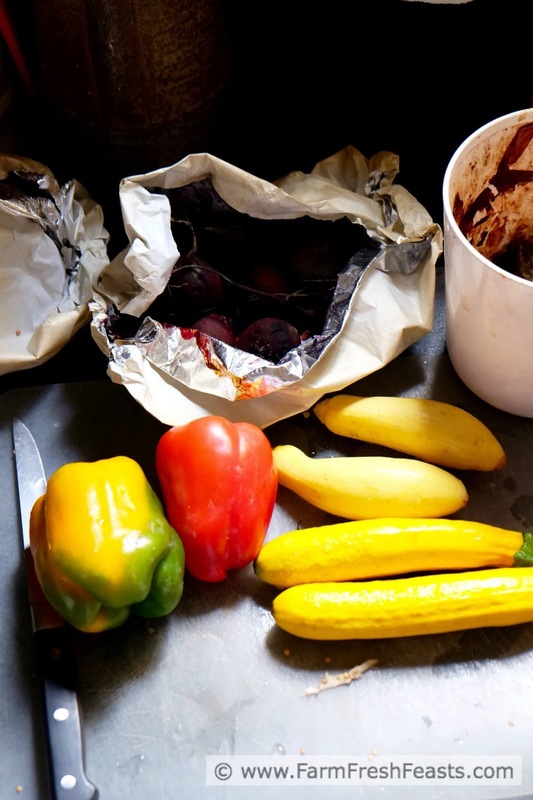 Practical advice for how to save ripe summer farm share vegetables--by roasting--for use in a kid-friendly spaghetti sauce all year long. The purpose and timing of this post reflects my mission for this blog: to provide practical support for local eating. We chose to get a large Community Supported Agriculture (CSA) farm share not because I'm a masochist and like to torture myself with overwhelming quantities of vegetables for the kids and I to eat while my spouse is deployed because it's a good value and I know if I put up the produce properly, I'll be feeding my family from the farm share all year long. 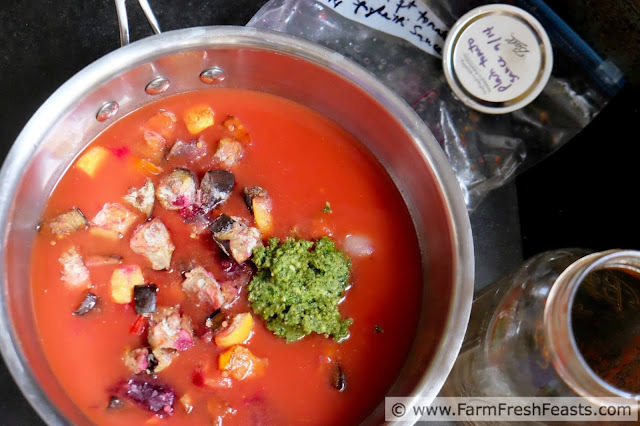 With a couple of tried-and-true techniques, including #4 from this post, and a substantial Visual Recipe Index by Ingredient filled with ideas for what's in the box, my goal is to help you feed your people from your farm share as well. Let's talk fantasy versus reality, especially as it pertains to spaghetti sauce. In a fantasy world, I'd start with ingredients like this and spend a leisurely day chopping and simmering in my spotless kitchen [this is my fantasy, after all]. 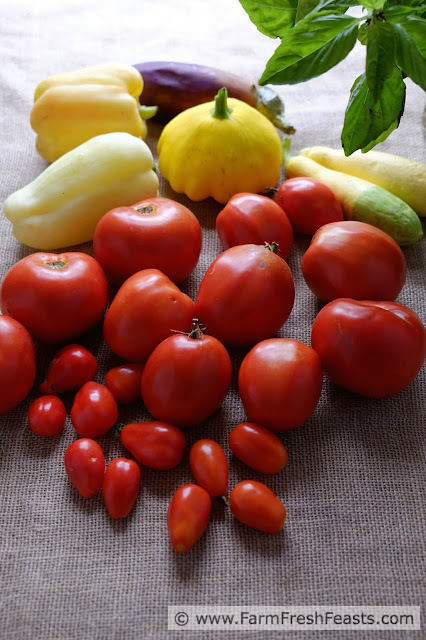 Tomatoes would always be ripening in m weed-free back yard [no need to watch where you step either], basil would be fresh for the plucking, and I'd have an interesting assortment of eggplant, peppers, fennel and squash to make flavorful sauce. [Oh, and plenty of freezer space while we're talking fantasies]. In reality, this is what the start of my spaghetti sauce often looks like. It's a bit beetier, no? I grab a bag of vegetables and a piece of Parm rind out of the freezer, a jar of tomatoes out of the pantry, and 30 minutes later I've got sauce. Homemade sauce in a half an hour is possible only because I did some prep work in the late summer, as in right about this time of year. 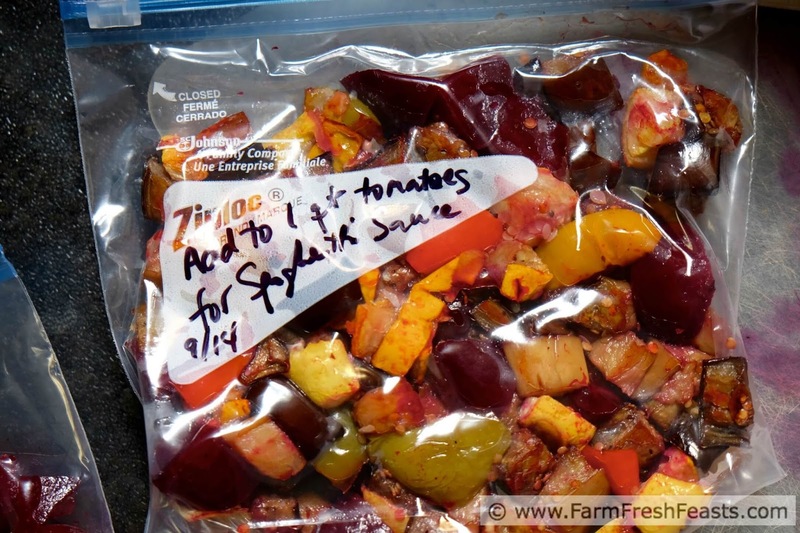 Typically I roast my vegetable surplus and freeze it in bags as shown, but this year I'll be throwing the farm share on the grill. When I have more propane. Funny, how propane is a necessary ingredient when you have a gas grill. Sunday night I came back from sled hockey camp [my son plays, I'm a hockey mom] planning to Grill All The Things in the crispers. I'd forgotten I was almost out of propane when I made pizza last. I turned on the oven instead. Using my previous little grill, a tank lasted almost 2 years. Now it lasts about 4 months. Just like you need lids and jars when you're ready to get canning, or a fresh roll of bags when you're freezing produce (Amazon affiliate link) , you need propane to grill. If you have a gas grill, that is. Lesson learned. Note: I tend to cook all of one vegetable together if I have a lot of it [I have been known to eat all of one item on my plate before moving to the next]. 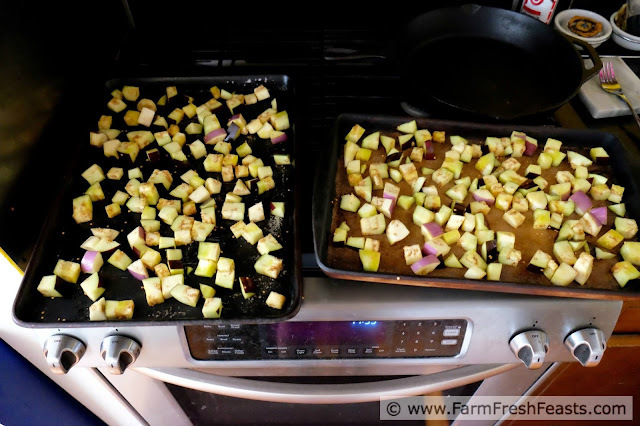 As my photo shows, I had a ton of eggplant when I had my camera out, so I roasted two trays. The rest of the veggies combined filled another two trays. 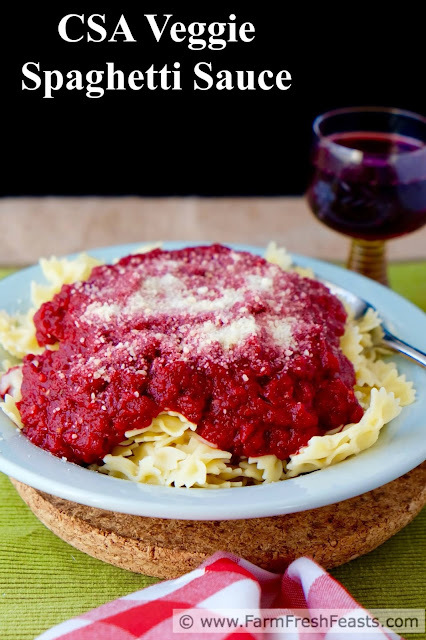 My cousin Cindy, the one I haven't met, suggested adding beets to my spaghetti sauce. She's spot on--this uses up beets in the way kids will eat, and adds to the rich flavor of the sauce. I keep the beets separate until the end since they make everything pink anyway. After it's all roasted I package the goods up in freezer bags, label them so I know what I'm looking for 5 months later, lay flat on a tray to freeze initially, then store wherever there is room. When the time comes for spaghetti, I grab a bag from the freezer and a jar of tomatoes from the pantry. I throw in a Parmesan rind because I pick up ends marked down at the fancy cheese counter of my local Kroger [actually the larger store near where my daughter takes sewing has cheaper Parm rinds, go figure]. I will often add a scoop of pesto [also from my freezer stash] for flavor, but a few teaspoons of dried Italian seasoning will do as well. After this simmers for about 20 to 30 minutes (and the vegetables are fully heated) I grab the immersion blender and make it smooth (reserving the Parm rind to add back after). 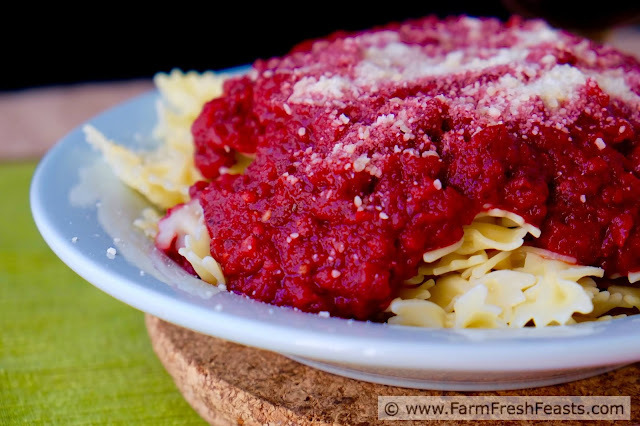 The end result is a rich, flavorful spaghetti sauce made from the farm share and enjoyed by my family during the rest of the year when we're not getting farm fresh vegetables. 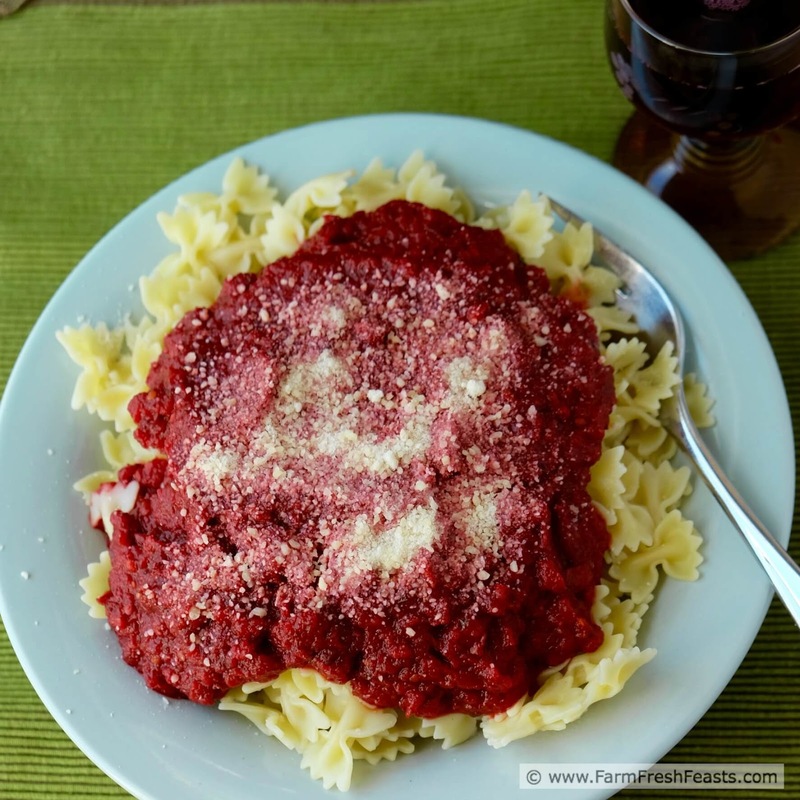 Make the roasted vegetable spaghetti packs. Preheat the oven to 400 degrees Fahrenheit. Chop the vegetables to a uniform size. I typically go with the size of onion since I often use farm share onions with a smaller bulb than store bought onions, but whatever size works for you. In a large bowl, toss the chopped vegetables with a generous slug of olive oil until coated. Spread out on rimmed baking sheets. You don't want to crowd the vegetables together, they need room to roast, not steam. Steaming is for beets. Sprinkle a pinch of salt and a few grinds of pepper across the top of the vegetables and place in the oven. Set the timer for 15 minutes. When the timer rings, stir the veggies. Repeat this process (15 minutes roasting, then pause and stir) until the vegetables are softened and browned. Remove from oven and dump into a large bowl (you can use the same one, raw + roasted veggies can play together). 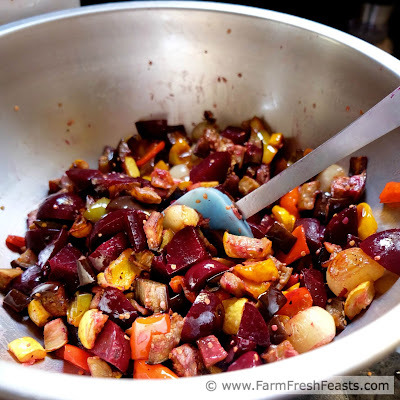 Once all the vegetables have been roasted, add in the beets and garlic and stir to combine. Portion out about 3 cups of vegetables into freezer safe bags, label, and freeze flat on trays before moving upright to store however you like. Make the spaghetti. I often start by taking a pack out of the freezer and letting it thaw on the counter for about 30 minutes, but I should probably say I place the package in the refrigerator the night before to thaw. I just don't really plan ahead like that, though. Spaghetti is a last minute meal in our house. If I'm using meat, I'll start by browning Italian sausage in a 3 quart saucepan, draining the fat, and then dumping in a quart of tomatoes or tomato sauce. Add in the partially-thawed vegetables, pesto, sugar and seasonings. Stir to combine. Toss in the piece of Parmesan rind and simmer for 20 minutes. [At some point you'll need to cook your pasta according to package directions]. 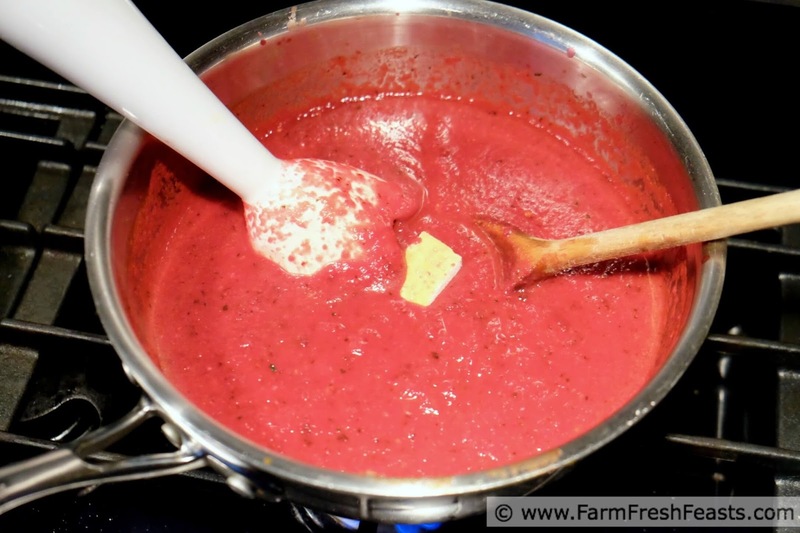 Remove the rind, use an immersion blender to puree in the pot for a smooth sauce, and return the rind to the sauce. Simmer another 5 minutes, then taste. Do you need a bit more salt or pepper? Add them. Serve over pasta, with plenty of cheese. I am a big fan of Greek spaghetti, with a layer of crumbled feta between the noodles and the sauce. Yum! Using the farm share to feed the family all year long--it's how I roll. Fantastic concept. 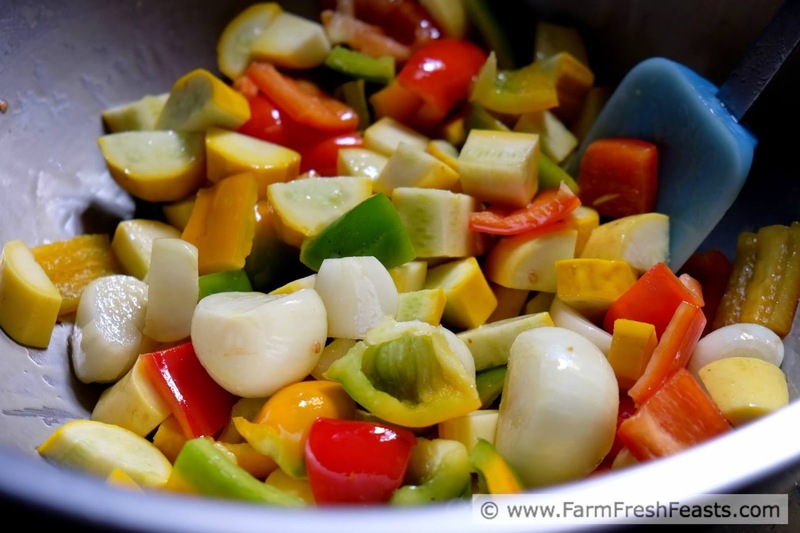 I love the idea of roasting the excess veggies simply to toss into the freezer to be used later in life for pasta sauce. You are clever and also very much responsible for feeding my family from the farm share year round. You are totally sweet to say so! Loved the transition from fantasy to reality. This looks so good and the idea of using up all the veggies is brill! There is a blurred line between fantasy and reality in my life! I love this sauce! And what a perfect way to have it all year round. I'm going to make this and store it in my freezer!! Before I started storing a cow in my freezer it was the most excellent place to store sauce!